Following this week’s CAFO ruling in the District of Columbia Court of Appeals, Smithfield Foods, the world’s largest pork production and processing company, is looking for another way to worm its way inside our hearts—or just replace them altogether. Reuters reports the company launched a bioscience unit this week, paving the way for industrially-produced pork organs to be transplanted into human bodies. A pig heart is about the same size as a human heart, and scientists have been trying to make pig-to-human transplants viable for decades. But so far, nothing has really worked—certain porcine viruses pose huge risks, and the human body has a history of rejecting transplants from other species. The team has already snipped 62 harmful genes from pig cells. Xenotransplantation, the term for cross-species organ replacement, has been used for centuries with varying degrees of success. According to a history published in the journal Baylor University Medical Center Proceedings, a pig-to-human corneal transplant was attempted as far back as 1838. Scientist Keith Reemtsma performed a series of thirteen chimpanzee-to-human kidney transplants in the 1960s, and one of the patients lived for nine months before abruptly dropping dead. Cross-species skin grafts were all the rage in the 19th century. Frogs were favored because they were hairless and cheap, and sometimes they were skinned alive in the operating room. We’ve come a long way. Heart xenotransplants are nothing new either, though a successful attempt would be truly revolutionary. The first documented effort was in 1964, when Dr. James Hardy transplanted a chimpanzee heart into a human patient. The human patient was already in a coma with both legs amputated, and would not have been deemed a fit recipient for a heart transplant by today’s standards. The chimpanzee heart functioned for a few hours but was ultimately too small to support human-scale blood flow. Two decades later, in 1983, an infant nicknamed “Baby Fae” received a baboon heart and lived for 20 days before her body rejected the organ. She died shortly after. 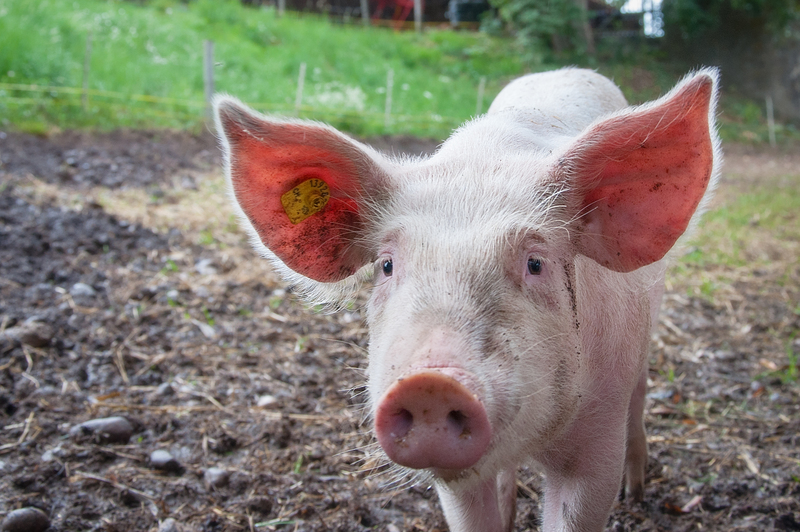 The first pig-to-human organ transplant could occur later this year as part of a clinical trial. But scientists have advanced by leaps and bounds in the last few years. The same Reuters story reports that George Church, a Harvard genetics professor, has been working on engineering “humanized pig organs” using the revolutionary gene-editing technology CRISPR. He founded bioengineering firm eGenesis with biologist Luhan Yang in 2015, and the team has already snipped 62 harmful genes from pig cells. Eliminating those genes is critical to making cross-species transplants work, and no one’s ever been able to do it before. Church told Reuters the first pig-to-human organ transplant could occur later this year as part of a clinical trial. Initial xenotransplants would be carried out on people deemed too sick to receive human organs. The U.S. market for pork byproducts already tops $100 billion. Smithfield doesn’t have a direct role in the research eGenesis is doing. But Church told Reuters that companies like Smithfield would be necessary once the process is perfected and ready to scale. Scientists will need partners to breed the animals, and it looks like Smithfield hopes to be first in line. Stanton also told Reuters that Smithfield is working on deals with two separate companies for the sale of organs, though she didn’t disclose the companies’ identities. She said that while the company is not currently breeding genetically modified animals like the eGenesis pigs, its first forays into xenotransplantation will likely flip the process: Take organs out of pigs, remove their DNA, and replace it with human DNA. Stanton’s office did not immediately respond to a request for further comment. It’s hard to imagine a world where pig hearts can viably be substituted for human hearts. But ten years ago, it was also hard to imagine a world where houses could be built with 3D printers.